Fidelio: Abscheulicher, wo eilst du hin? I have written mezzo in the heading, because the record company says so. 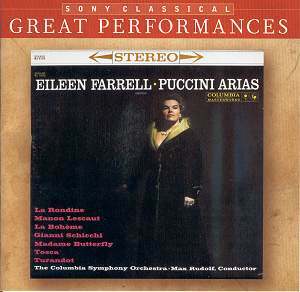 In reality Eileen Farrell was a soprano � the repertoire on this disc is firmly in the soprano department � even though late in the career she sang in a lower range, notably when she recorded The Sound of Music for Telarc, where she was Mother Abbess, Her singing of Climb Ev�ry Mountain still gives me goose pimples for her warmth and intensity. But that was in December 1987 and she was 67. She had indeed a long career: born in Connecticut in 1920 she moved to New York in 1939 and within months had a job in the chorus of CBS Radio. Only a few months later she was regarded as too loud for the chorus and got a programme of her own, Eileen Farrell sings. From then on she was busy in a wide range of repertoire from opera to popular songs. She even had a bestseller in I�ve got a right to sing the blues and Over the rainbow. She filmed with Louis Armstrong and made herself a name as an opera singer as Marie in Wozzeck (1950). It was another decade before she had her belated debut at the Metropolitan in 1960, singing Gluck�s Alceste. This disc, recorded a year prior to this debut is a worthy memento of that occasion since an aria from that opera is included. Her Met career lasted only five years but she appeared as guest in Europe and the US and she recorded extensively. In her recorded legacy there is another opera recital with a typically wide scope of repertoire (Gluck, Weber, Verdi, Ponchielli, Tchaikovsky, Massenet, Debussy and Menotti � I have it on a Seraphim LP in mono and there is no information about recording dates). She made only one complete opera recording, Donizetti�s Maria Stuarda, where she was Elisabetta against Beverly Sills in the title role. The present offering in Sony Classical�s new Great Performances series is a pairing of two LPs, one of them an all-Puccini recital, the cover of which now adorns the CD booklet. On the LP cover the conductor�s name is spelled �Rudolf�; in the booklet and on the back of the jewel-case it is �Rudolph�. Moving freely between genres it comes as no surprise to find her in such a variety of roles, from O mio babbino caro (Gianni Schicchi) - light, lyrical, suave and lovingly phrased � to Turandot�s In questa reggia. Initially she still sounds like a lyrical soprano. Listen to her in Li��s aria. �This is no icy princess�, one thinks but then her tone gradually hardens, the steel gleams through. When she comes to the big climax her fortissimo is hefty enough to cause some distortion. It is a glorious reading. I recall an RCA LP from about the same time where she, with the Boston Symphony and Charles Munch, sang Isolde�s Love Death just as stunningly. In between these extremes � Lauretta and Turandot � she goes through most of Puccini�s great female portraits and manages to put a stamp of personality on most of them. Her Musetta is glittering and teasing, her Mimi is warm, though sad in the second aria, her Tosca is proud and in Vissi d�arte broken-hearted. Though her Butterfly can hardly be mistaken for a teenage girl it is still a youthful sound. The �fillers� further enhance the value of the disc with an exquisitely beautiful Alceste aria, with high-strung drama in the Beethoven pieces, where she in Ah perfido! �contrasts inward self-pity with vengeful wrath. Her readings of these two testing pieces can stand on their own against almost any other latter day soprano. The two Freisch�tz arias bring the recital to a warm conclusion, delicate, beautiful. Max Rudolf was an experienced operatic conductor and he is lenient to the soprano when needed � the wilful Musetta gets her rubatos � but otherwise he paces the music admirably. As with other discs from the same period in this series the stereo image is very wide, the Steinway in the introduction to Doretta�s dream booming right out from the left hand speaker. The instrumental balance is good though CBS produced more sophisticated sound a few years later. None of this need deter anyone from acquiring this disc with one of the truly great sopranos of the last fifty or so years.